Arduino is a great developer platform, but you quickly run out of pins, especially the digital ones. And you rarely use all 6 analog pins in an application. This selector switch uses only one analog pin. 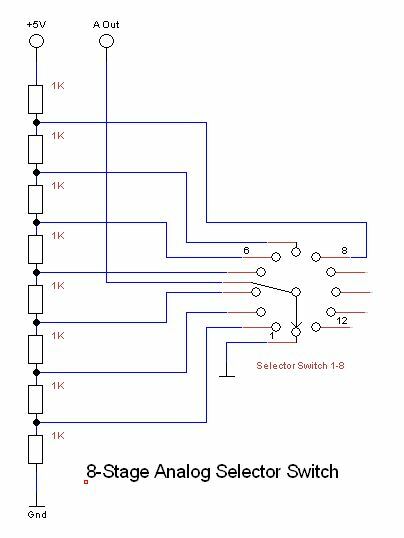 In this example, I have build the switch with 8 x 1K/5% resistors and set the rotary selector switch to 8 positions. 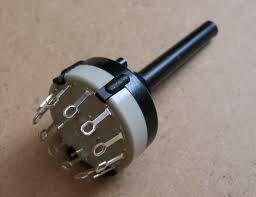 The easiest way to build it, is to solder the resistors directly onto the rotary selector switch. Now we have an integer value for the position of the rotary selector switch. Hope you like it. Tak for dette smarte trick. Har rettet et par fejl i din kode. Ja, det har du da ret i. Hermed rettet. Thanks man. Nice bass playing, btw. Natacha: I am not sure you can use a coded rotary this way.